Sounds familiar doesn’t it? Inspiration is that most elusive of goals. The prize just out of our reach. The next level on the game. How do we achieve it? Clarity of purpose and a certain adhering to a plan, that we thought was brilliant only a short while ago? Do we succumb to the biscuit break and another shot of coffee, or raise our self esteem by attacking the pile of ironing before us? My personal approach is to work to a specific point in the hour on the clock to take a 3 minute break for nature and a cuppa as a reward. If I look up and find the time has passed beyond my target – good news! 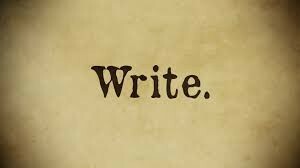 What do I need to write today, this week, this month? I like to know who has a deadline for me as it gives me a focus point for my anger engendered by my ineptitude. Before long, I am into the second chapter of the ways in which I will wreak vengeful retaliation on this object of my misery. Great, my brain has written 200% of something I do not need. Will I ever vanquish this foe? After the 3rd coffee of the morning I reach my finishing line. Another 1500 words. Another month of the mortgage paid. Gleefully, I can look forward to the same exquisite process tomorrow. Agents – a considered view → ← Is watching this a cure for writer’s block?